Due to the rising concerns related to the depletion of fossil fuel sources, and the climate change associated to the usage of such sources for electricity generation, there is a high pressure for diminishing the energy consumption of all the industrial sectors in order to mitigate the negative impacts associated to the energy required to manufacture a product. Computer numerical control (CNC) machining accounts for a larger portion of the total energy drawn from the grid by the manufacturing sector. Therefore, the energy efficiency of the manufacturing operations should be enhanced to optimize their energy consumption and to reduce their environmental burden as well. 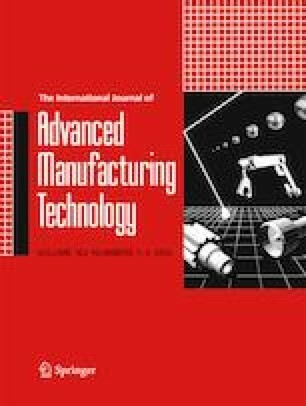 As a mean for achieving sustainable manufacturing operations, the present paper outlines an experimental study to optimize cutting parameters in turning of AISI 1045 steel. One of the main objectives was to minimize the total specific energy consumed by the CNC machine tool during material removal, considering dry cutting to decrease the environmental impacts linked to the coolant usage. As a measure of the surface quality, the second objective was to reduce the average surface roughness of the workpiece. The same material removal volume was considered for all the experimental trials. The response surface method was used to obtain the regression models for all the variables studied, and the desirability method was selected for defining the values of these variables, named the cutting parameters, that minimized the quantity of electrical energy consumed, and surface roughness. The results achieved showed that it is possible to obtain a more sustainable machining process without sacrificing the productivity of the process and the final quality of the product. The corresponding author would like to thank the ITESM Campus Toluca, the Consejo Nacional de Ciencia y Tecnologia (CONACyT) and the Consejo Mexiquense de Ciencia y Tecnología (COMECyT) for providing financial resources.